2.2GHz Processor 256 GB Storage 2.2GHz quad-core Intel Core i7, Built-in battery (9 hours),Force Touch track pad. I have had this product for a year and I love it. There are very few drawbacks to this product that can be easily ignored. Not the most compatible with other non-Apple product but since I have an iPhone it isn’t very problematic. I’ve been using this laptop since the last 1.5 years but honestly I have barely used it at all. Always been a windows user and was enamored by the Mac. I like the interface, the Apple sign at the back of the monitor and the value. Tried a lot to understand the single finger, two finger, three finger and all the other user techniques to much avail but turned out it’s quite complicated for me. Infact I have found that it’s processor is very slow, uploading videos from My GoPro takes forever, any icon I click keeps bouncing for 5-8 seconds before opening up and I still feel the app is running in the background to be fully operational. It also heats up a lot so keeping it on my lap is out of question. Any decent Windows 10 with 4GB RAM and a graphics card would have done a better job. Offcourse the colors are visually stunning on a Mac but one thing it’s not that user friendly. So I&apos;m considering buying a regular window laptop soon. I recently purchased this MacBook Pro to replace a 2011 year model and oh wow, what a difference! The screen is certainly the best reason to upgrade in case you are contemplating on doing this. With my old Macbook Pro I had to have the screen at a particular angle to see the picture properly or to see colors properly. Not so with this model. No matter how you have your screen angled, you will see the picture accurately and it looks awesome. 6 GB ram which is more than enough for video editing as well. Battery life easily lasts 6 hrs. Not a gaming laptop as comes with AMD chip set. 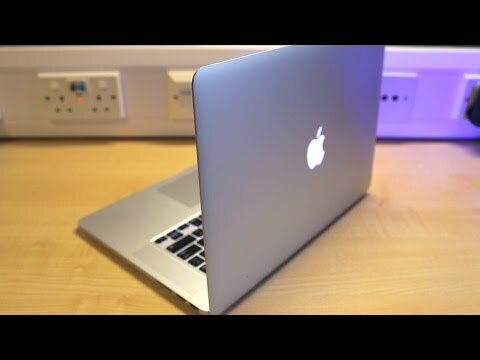 8 Pricebaba users have written their experience with Apple Retina MacBook Pro 15-inch 2015. If you own Apple Retina MacBook Pro 15-inch 2015, please do leave your feedback too.